Remember how when you were a kid, everything in the kitchen was so amazing during the holiday season? Why not bring a bit of that baking magic to your little ones this year? Not only are these projects fun — and tasty — but they might just help you start a new holiday tradition for your whole family. Does the holiday season inspire you to dust off the cake pans, fire up the oven and create something incredible? Whether you are an avid baker or just learning, the holidays are a great time to try your hand at some seasonal treats — and get your kids in on the action. And even if the simple thought of having miniature “helpers” in your kitchen makes you want to stick to cookies from the grocery store, we’ve got some ideas for you. One of the biggest potential problems with holiday baking is the mess. Even if you didn’t encourage your little ones to help you, there would still be a messy kitchen to clean up. Before you roll up your sleeves and start measuring, it helps to have a game plan. Choose recipes that are simple and can be completed easily. Multiple steps may be too difficult for the youngest kids, who like to see (and eat!) their results within hours, not days. Read each recipe and decide ahead of time which tasks are best for which kids — especially if you are working with multiple age ranges. Prepare your work area ahead of time. Gather all measuring utensils and bowls, ingredients, a step stool (if needed for little ones), a timer, baking pans and cooling racks. It may seem like overkill, but short attention spans are likely to get lost in the search for ingredients and bowls. 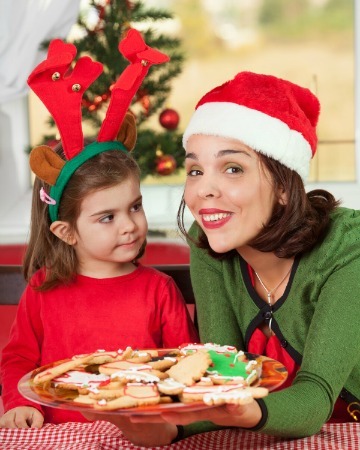 To make holiday baking fun, pick the right tasks and recipes for every age group. By the time your kids are teens, they are usually quite handy in the kitchen — if you can get them out of bed, that is. Teens may prefer to choose the holiday recipes they would like to make, or you could narrow it down to a few options and then let them choose. They should be able to run an entire recipe from start to finish, but they may want you to be available for any questions. Let them invite a few friends over for a holiday baking session, and then feel your heart swell (from the other room) at the sounds of them having a blast.